Lloyd Harden (1927-2012) needed a winter hobby, something to keep him occupied when field work slowed. Being improvisational and creative, he began taking apart worn-out machinery and creating what he called "Creative Art from Used Parts" or "field art". The giant grasshopper was one of his first creations. He placed it on his property about 100 feet away from Highway 27. 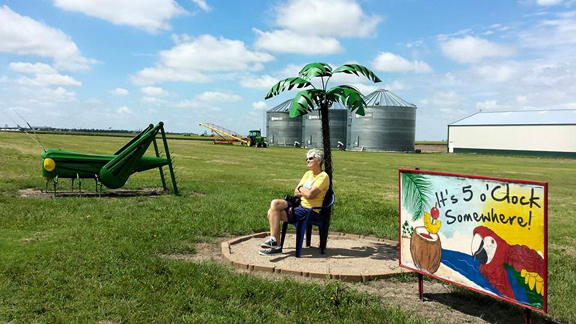 His collection kept growing to include a roadrunner, cowboy and cowgirl supporting a sign for Harden Farms, a palm tree (shown behind the grasshopper) and more. The grasshopper was originally a tan color, but the current owners have painted it John Deere green and yellow. 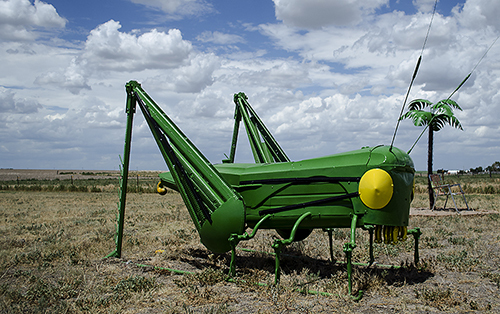 A grasshopper is an ironic choice for a farmer's sculpture, since grasshoppers do major damage to grain crops if left unchecked. Harden relished the irony. "Imagine what this one could eat," he said. The tract of land he used for display was in the government's Conservation Reserve Program (CRP). The United States Department of Agriculture (USDA) defines CRP this way, "In exchange for a yearly rental payment, farmers enrolled in the program agree to remove environmentally sensitive land from agricultural production and plant species that will improve environmental health and quality." The only crop Harden had planted was art. When a USDA inspector saw the creations, he forced Harden to move them closer to his home. But Harden still kept creating them and displaying them. When Harden died, his collection was broken up. These two pieces remain in Sherman County, a few miles south of his home, a silent tribute to a man who saw a creative vision in what others would see as worthless junk. To find them, drive Highway 27 or North Caldwell Street north from Goodland. They stand on the west side of the road about a mile north of the Highway 27-North Caldwell junction.